In the mid-1990s the Australian federal government started to outsource social services to non-governmental organisations (NGOs), creating new institutional relationships between NGOs and governments and inf luencing the ways NGOs operate. While much has been written about the effect of this change on NGOs, little attention has been paid to how this new way of operating has affected the communities with whom NGOs work. This paper draws on data from an ethnographic study of African community organisations in three Australian states (Tasmania, South Australia and Victoria) between 2010 and 2012. 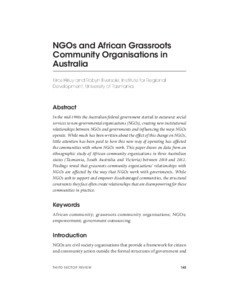 Findings reveal that grassroots community organisations’ relationships with NGOs are affected by the way that NGOs work with governments. While NGOs seek to support and empower disadvantaged communities, the structural constraints they face often create relationships that are disempowering for these communities in practice.